But you need to know python, R, PHP or more recently node.js, to be able to do that - these are the languages that scraperWiki supports. None are particularly hard to learn to the degree you need to be able to get on and do some scraping, but if you don't want to do that, here's an example of scraping using VBA, and some of the libraries on this site. For this example, we'll try to get the results of the Boston Half Marathon, available here. The objective is to get the thing into an Excel table - and as a bonus I'll also make an interactive Google Table and a static table for loading to a web site too. I'm using this one, because it's a bit trickier than the usual scraping activities where data is organized into tables - what we have here is some fairly unformatted data enclosed in <pre> </pre> tags, so we'll be able to use some simple regex to sort it out. Using those, I've traced the data I want to be within a <pre></pre> tag. This is pretty unusual - you would have expected this kind of data to be nicely formatted in an html table. Instead we have, essentially a snapshot of a printed report. 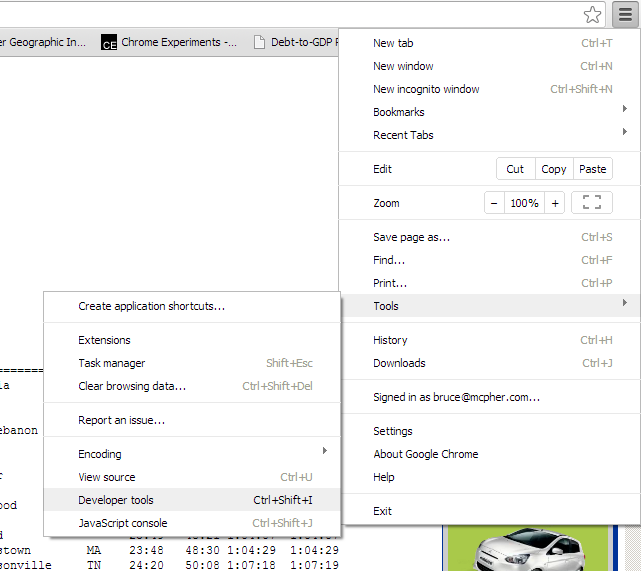 I'm using the cBrowser class, since I've already dealt with the mechanics of browser navigation elsewhere. When we return we'll have a nicely populated html document. We can find the text in the <pre> class like this. This is a one off scraper, so Im not going to bother too much about error handling. One thing I noticed was that the headings are underlined with equals signs. If I could find them, I'd know where the data started, and not only that, but the width of each column. This regex snippet will return a single match with the row of === markers. This will tell me not only where the headings are (on the row before), but where the data is (starting the row after), and where each column begins - at the beginning of each block of "=="
Now we can populate the headers and data in the sheet, using the "==" ruler as guide for where the columns begin and end. We'll use another regex to split the data into separate lines. Finally I did notice that the headings are a little misaligned to the data, so I need to make a small correction for that too. Here we have it- 6000+ lines scraped and copied to Excel. So how about we turn that into a google visualization. We can use Visualizing tables to make one from this data. The code is a one liner. 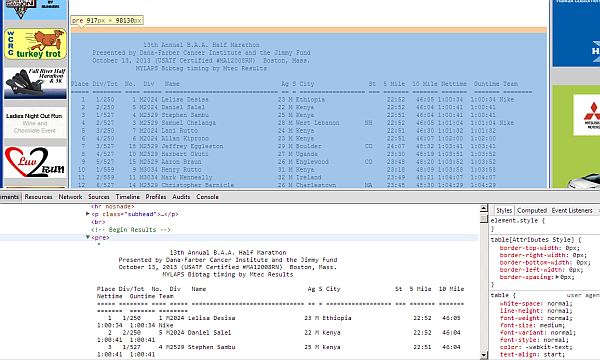 tableToHtml "marathonresults", , , , "google"
that can be hosted on a web site - You can see it here. tableToHtml "marathonresults", , , , "static"
also nicely formatted, and hosted here.